Marker at the summit of South Pass, Wyoming. “By information received from these gentlemen, it appears that a journey across the continent of North America might be performed with a wagon, there being no obstruction in the whole route that any person would dare to call a mountain, in addition to its being much the most direct and short one to go from this place to the mouth of the Columbia river. Any further party, who may undertake this journey, and are tolerably acquainted with the different places where it would not be impeded, as in all probability, they would not meet an Indian to interrupt their progress, although on the other route, more north, there are almost insurmountable barriers.”(Joseph Charles, 1813, Missouri Gazette, quoted from Will Bagley, 2014, South Pass: Gateway to a Continent, Kindle Edition, Loc. 629-633). Unfortunately, the report of an easy route across the mountains was buried by the news of the War of 1812 that had begun a few months before this first European traverse through South Pass. West aerial view of South Pass. Emigrant Trail segment over the pass shown by orange line. Continental Divide shown by white line with dominant flow directions shown by blue arrows. Faults shown by red lines: Dashed where buried or inferred, solid where exposed at surface: sawteeth on upthrown block of thrust fault, ball and stick on downthrown block of normal fault. The war interrupted exploration and the fur trade in the Rocky Mountain West for a decade. The Astorian assets were sold to the rival Montreal-based Northwest Company. The pass was rediscovered in 1824, this time by an Ashley party of trappers from the St. Louis-based Rocky Mountain Fur Company that included Jim Bridger, Tom Fitzpatrick, Jedidiah Smith and Etienne Provost. These European-American discoveries of mountain passes, like the Lewis and Clark’s discovery of Lemhi Pass 400 miles to the north, or the 17thCentury Spanish discovery of San Luis and Guadalupe Passes in New Mexico 760 miles to the south, were made with guidance, or at least with information obtained from Native Americans already familiar with the routes. Paleoindians settled in the Rockies at least 10,000 years earlier. They knew the geography of the mountains. The Continental Divide is an imaginary hydrologic line along the crest of mountainous terrane that divides drainage basins and transport direction of stream flow. The divide through the Rocky Mountains is sometimes referred to as the Great Divide and it separates flow to the Pacific Ocean (and Gulf of California) and the Gulf of Mexico. The fur trade flourished from 1825 to 1840 (Rendezvous years). In that time, a few thousand men explored and traversed the Rocky Mountains and became acquainted with many passes and paths through the mountains. No pass was better than South Pass for ease of travel. As the fur trade came to an end many of the surviving trappers became guides and scouts for the Army and emigrant trains for the next three decades. “the gate through which the United States would reach its empire,” (DeVoto, B., 1947, Across the Wide Missouri, p. 54). Maps showing the growth of the American “empire” over a decade with location of South Pass at the approximate Tri-Territorial point at the beginning of the 1840s and 1850s. Key territorial elements are listed for each decade. The Tri-Territory monument is located about 24 miles south of the pass. Elevation profile of South Pass from the last crossing of the Sweetwater River (Burnt Ranch on right) to Pacific Springs (on left). Vertical exaggeration is about 200 times the horizontal scale. South Pass landscape photos in the cardinal directions. Images: Oregon Buttes: Ericshawwhite photo, 2014, https://upload.wikimedia.org/wikipedia/commons/9/9c/Oregon_Buttes.JPG; Wind River Range: Barbara Dabos photo, ND, https://www.wyohistory.org/encyclopedia/stand-south-pass-wallace-stegner-wind-and-west; Burnt Ranch Crossing: Randy Brown photo, ND, https://www.wyohistory.org/encyclopedia/ninth-and-last-crossing-sweetwater; Pacific Springs: Terry Del Bene photo, ND, https://www.wyohistory.org/encyclopedia/south-pass. ​The Archean basement rocks underlying South Pass are of three types, 2.5 billion-year-old (Ga) Lake Louise granite and granite pegmatite, 2.7 Ga Bridger granite and 2.8 Ga greenstone metasedimentary and metavolcanic rock entrained within a gneissic complex. Proterozoic mafic dikes intruded the basement rocks from 1.88 to 2.06 Ga. The basement rocks are buried by Tertiary beds of tuff, conglomerate and pebbles and pediment deposits containing cobbles and boulders of Archean metamorphic and granitic rocks deposited in the South Pass and Split Rock Formations (the latter formation name was abandoned by the U.S. Geological Survey and replaced by Arikaree Formation (Denson, 1965); but usage continues with the Wyoming State Geological Survey (WSGS, 2006, Geologic map of the South Pass) and the Wyoming Geological Association (WGA 2014 Stratigraphic Nomenclature Chart)) . These Tertiary rocks have an age range of 5 to 27 million years before present (Ma). Generalized geologic map of the Greater South Pass region showing the location of the South Pass segment (brown and gold dotted line) of the emigrant trail. The Laramide-age Wind River Thrust Fault has sawteeth pointing to the elevated block. The Miocene-age Continental normal fault has stick and ball symbols on the downthrown block. Image: After Bayley, R.W., Proctor, P.D., and Condie, K.C., 1973, Geology of the South Pass Area, Fremont County, Wyoming: U.S. Geological Survey Professional Paper 793, Fig. 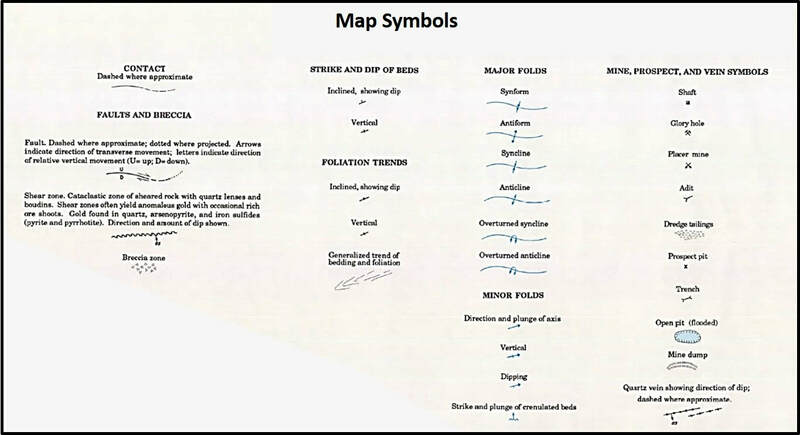 1, p. 2, https://pubs.usgs.gov/pp/0793/report.pdf. The Wind River Range is Laramide structural arch elevated by a southwest directed thrust with a maximum displacement of 35,000 feet. Laramide represents the tectonic period 70-50 million years ago (Ma) in the Rocky Mountain area when basement-cored arches were elevated, and the intervening basins subsided due to subduction along the western coast of North America. Paleozoic and Mesozoic rocks were fractured, folded and eroded from the core of the Wind River Range. They are exposed on the gentle eastern flank of the structure that dips into the Wind River Basin. Tertiary sediments lap onto the core of the range along the southeast margin of the uplift. The Middle Miocene Continental fault was displaced about 1,400 feet down-to -the-north about 12 million years ago (Ma). It is the collapse of this portion of the range that created the portal through which about 500, 000 fur trappers, explorers, emigrants and miners passed. The COCORP Seismic Lines 1 and 1A (ARCO 1977 here) show the subsurface structure along this flank of the Wind River Range. COCORP stands for Consortium for Continental Reflection Profiling. It was established in 1975 to study the structure and evolution of continental crust. 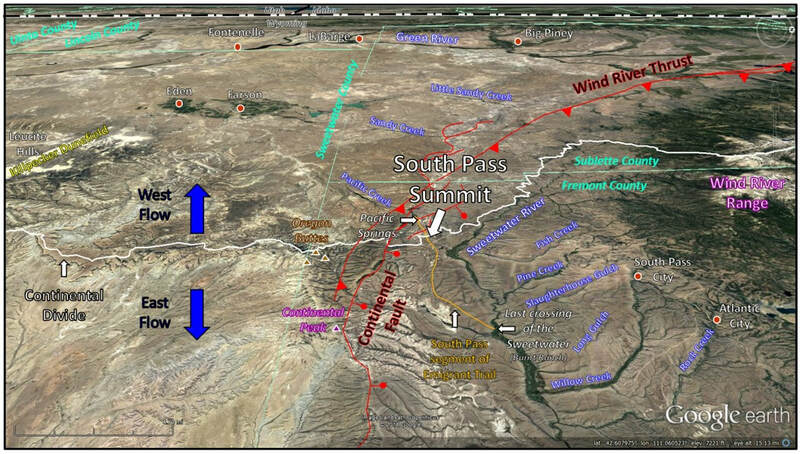 COCORP seismic line aligned perpendicular to the Wind River Range near South Pass. Relationship of faults and Tertiary sediment cover displayed. Geologic abbreviations: Tm: Miocene sand and shale, Tw: Eocene Wasatch, Tfu: Paleocene Fort Union, Krs: Upper Cretaceous Rock Springs, Kb: Upper Cretaceous Baxter, Kf: Lower Cretaceous Frontier, Kd: Lower Cretaceous Dakota, Pp: Permian Phosphoria, pCg: Precambrian Granite. Image: After Basham, W.L. and Martin, W.F., 1985, The Wind River Thrust Fault, Wyoming in Gries, R.R. and Dyer, R.C., editors, Seismic Exploration of the Rocky Mountains: RMAG and DGS, Figs. 2 & 3, p. 60-61. The seismic line shows a large displacement of the basement on a shallow dipping southward-directed Wind River Thrust fault. Overturned Cretaceous units are present in the footwall directly beneath the fault. The Continental normal fault down drops the crestal block of the Wind River Range to the north. Tertiary fill (light yellow on figure above) from the uplifted southern block is shed over the exposed Precambrian rocks creating the wide, subdued topography of South Pass. 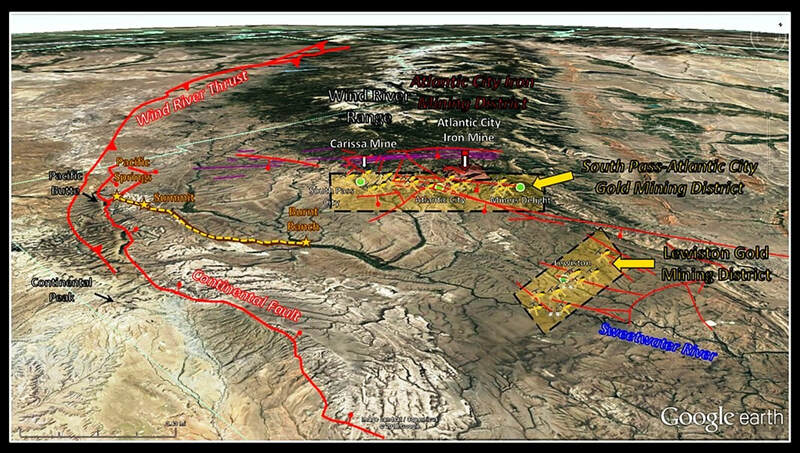 The timing of the movement on the Continental fault may be related to the collapse of the Granite Mountains along the South Granite Mountains fault system located eleven miles to the north. Detailed geologic map of the South Pass Segment of the Emigrant Trail across the southeast Wind River Range. Trail landmarks are shown with a brown and gold stars. The passage travels over Tertiary age South Pass and Split Rock Formations. Lander Cutoff discussed in the Sinks Canyon site (https://www.geowyo.com/sinks-canyon.html). Burnt Ranch received its name after Indians burned all the buildings twice in the 1860s. The ranch was the point where the Lander cutoff divided from the Emigrant trails. This cutoff avoided Mormon country, the southern desert terrane, supplied abundant wood, grass and water, and saved a week of travel to Fort Hall, Oregon Territory. The ranch also served as a stage station and Pony Express relay stop. Oregon Slough is a swampy wetland to the south of the trail. Pacific Butte is on the southern upthrown block of the Continental Fault and consists of eroded Wasatch Formation. Continental Peak, the namesake for the fault, is located on the downthrown side of the Wind River Thrust and consists of landslide deposits overlying Bridger Formation and Laney Shale Member of the Green River Formation. The Oregon Buttes are also on the footwall of the thrust, compositionally like Continental Peak with the addition of patches of Split Rock Formation on top of the Bridger Formation. 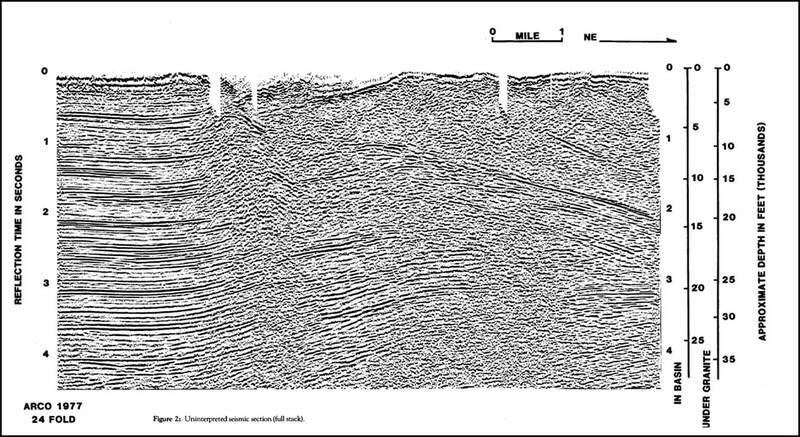 Image: After Sutherland, W.M., and Hausel, W.D., 2006, Geologic map of the South Pass 30' x 60' quadrangle, Fremont and Sweetwater counties, Wyoming: Wyoming State Geological Survey Map Series 70, scale 1:100,000, http://www.wsgs.wyo.gov/products/wsgs-2006-ms-70.pdf. 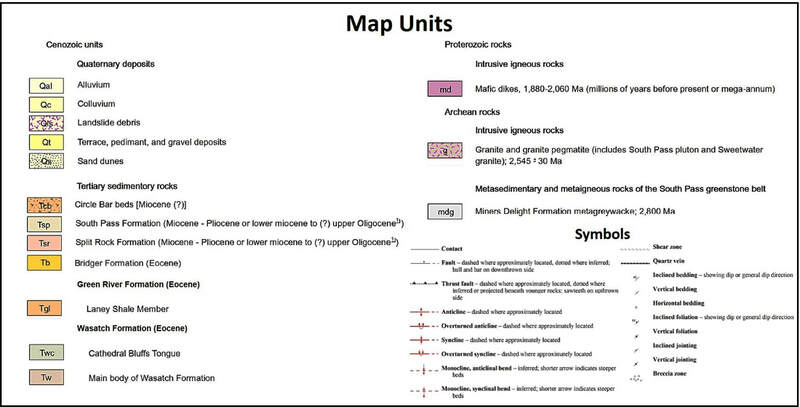 Cenozoic and Precambrian units displayed on South Pass geologic map. Image: After Sutherland, W.M., and Hausel, W.D., Ibid. Rumors of gold from the Sweetwater and South Pass area arose in the 1830s and 1840s, during the fur trade. There are also reports that placer gold was discovered by early trail emigrants. Soldiers stationed in the region to protect the transcontinental telegraph during the Civil War, searched for placer gold in their off time. But the first known discovery came in 1867, and it happened to be the largest accumulation of gold to be discovered at South Pass. Placer gold was tracked upstream from Willow Creek to the Carissa ledge outcrop. The Carissa Mine produced the most gold of any mine in Wyoming (50,000-180,000 ounces) and ignited gold fever at South Pass. Within a year four mining communities (South Pass City, Atlantic City, Miners Delight (aka Hamilton City), and Lewiston) sprang up with a population of about 2,000 people. This gave the South Pass area the second highest population density in the Wyoming Territory and was briefly considered for the territorial capitol. South Pass City, the largest mining camp, had 17 bars, 5 hotels, 4 law firms, 3 meat markets, 2 bakeries, a local newspaper, a billiard parlor, shooting gallery, bowling alley, a red-light district, Wyoming’s first Masonic Lodge, and was the birthplace of the Wyoming Territory woman’s suffrage act. By 1872 the gold boom went bust and the population dwindle to about 100 people. The mine was briefly reopened for seven years at the beginning of the 20thcentury. Midwest Mines resumed operations in the 1920s, but the mine and mill were closed with the stock market crash in 1929. The Carissa mine was closed permanently in 1959. The Wyoming 75thAnniversary Commission purchased the city in 1966 to protect and restore South Pass City. The Carissa mine and mill were purchased in 2003.Public tours of these historic landmarks are available. The iron ore in the area was first mapped by the U.S. Geological Survey in 1916. Iron ore mining and processing techniques at that time were inadequate for an economic mining of the low-grade banded iron deposits (taconite). The increased demand for steel in post-World War II America renewed interest in western taconite deposits. The U.S. Geological Survey restudied the South Pass area in 1958. Northwest aerial view of the three South Pass area mining districts. The Lewiston district is located about 13 miles east-south east of the South Pass-Atlantic City district. Both districts extract gold ore from the Miners Delight Formation. The Atlantic City iron district recovers ore from banded iron formation beds in the Goldman Meadows Formation. Image: Google Earth; Data from USGS topographic map. ​Both ore types occur within the Archean-age South Pass greenstone belt (for more on greenstone belts see https://www.geowyo.com/rattlesnake-hills.html, and https://www.geowyo.com/north-platte-river-one-dammed-thing-after-another.html). The belt is a structurally deformed synform basin bounded by granitic rocks. Sedimentary and volcanic rocks (greenstone precursors) were deposited about 3 billion years ago, underwent deformation (due to subduction and accretion along the Wyoming craton margin), and were metamorphosed 200 million years later (2.8 Ga). The Miners Delight Formation is the host rock for the gold ore deposits. The beds are intensely folded, with steep to vertical dip. Shear zones are aligned with foliation that trends east to northeast. The ore veins occur in shear zones on plunging structures near lithologic contacts between the metagraywacke (mdg), schist (mds), and amphibolite (mdo) lithologies. Two theories have been suggested for the origin of the gold. A syngenetic model where gold was deposited at the same time as the host sediments on the seafloor (e.g. black smoker). In contrast the epigenetic model introduces the gold-bearing hydrothermal fluids into existing rocks and are concentrated along fault and shear zones (e.g. during metamorphism of sedimentary beds). South Pass area produced 355,911 ounces of gold with about 94% coming from the South Pass-Atlantic City District. 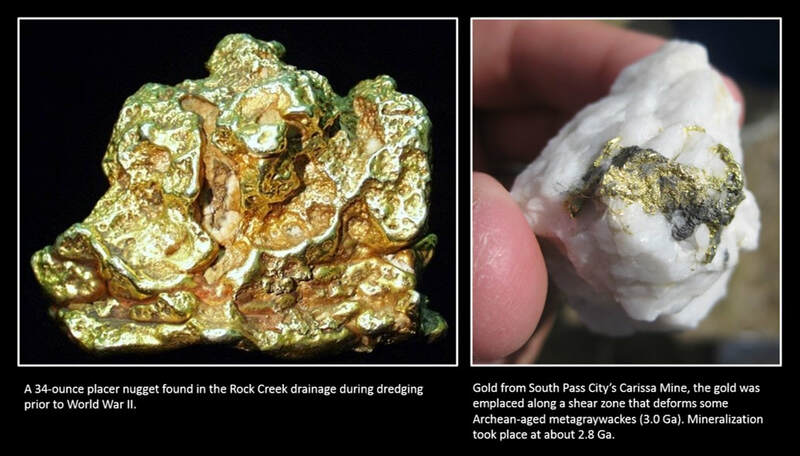 Placer and vein gold from the South Pass area. ​The iron ore occurs in banded iron formation beds in the metasedimentary Goldman Meadows Formation (gmi). These units consist of banded quartz-magnetite-amphibole interbedded with quartzite, schist and amphibolite. They were deposited on an ancient seafloor as the earth’s oxygen levels were increasing, causing iron minerals to precipitate from the ocean. U.S. Steel operated the mine northwest of Atlantic City for 20 years. The ore was shipped to the Columbia-Geneva steel mill in Utah for processing. More than 90 million tons of ore were mined from 1962 to 1983. Banded iron formation from Atlantic City area taconite beds. 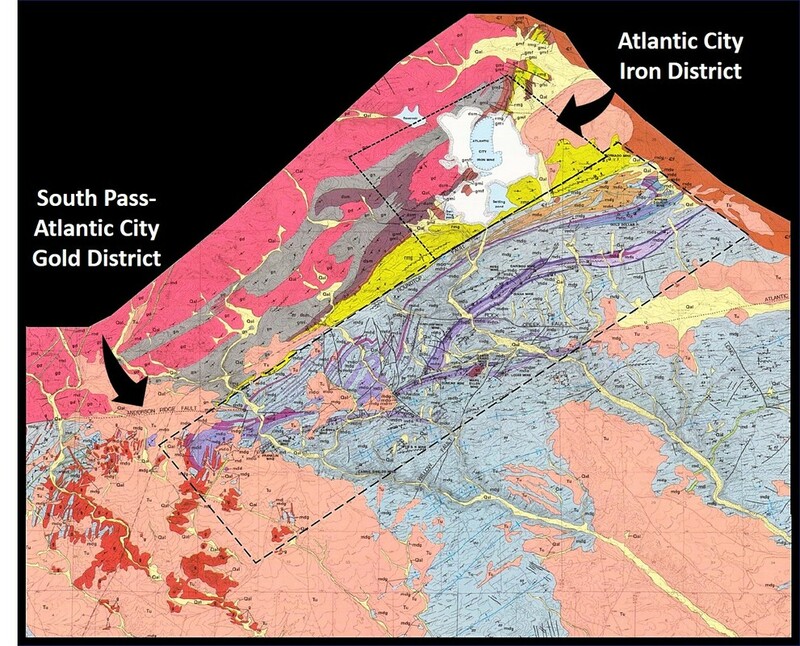 South Pass-Atlantic City mining districts. 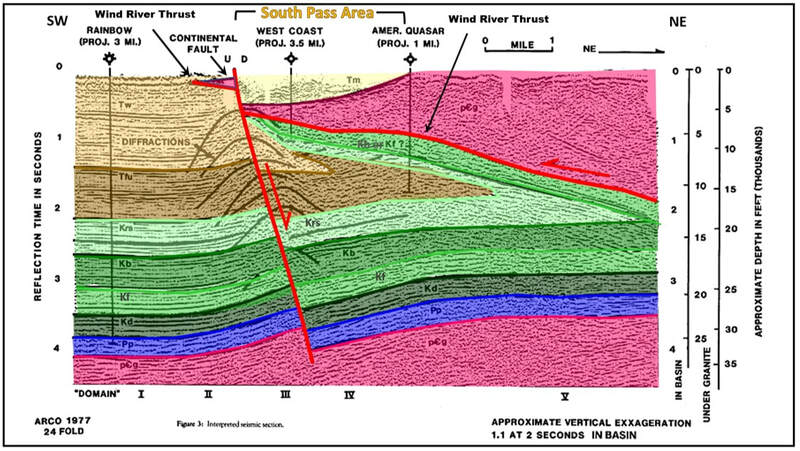 Gold mineralization shows both structural and lithologic control. Iron ore mineralization is stratigraphically restricted to banded iron beds. Gold: long black dash, Iron: short black dash. Geologic codes: Gold ore units: mdg, mds, mdo; Iron ore unit: gmi. Lewiston Mining District located 13 miles east of South Pass City. 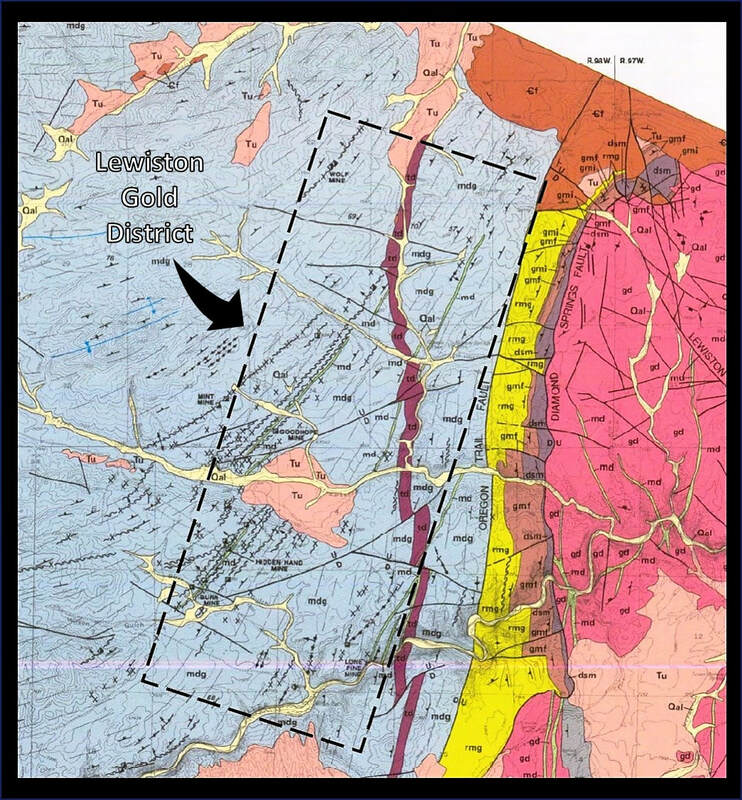 Geologic code: Gold ore unit: mdg, Note alignment of shear zone with foliation. ​The trappers, explorers, emigrants, soldiers, and miners are long gone from South Pass. What remained were some tracks, several structures, many tales, and, of course, the wind. This important passage through the Rocky Mountains was created by the unique geology of the area. 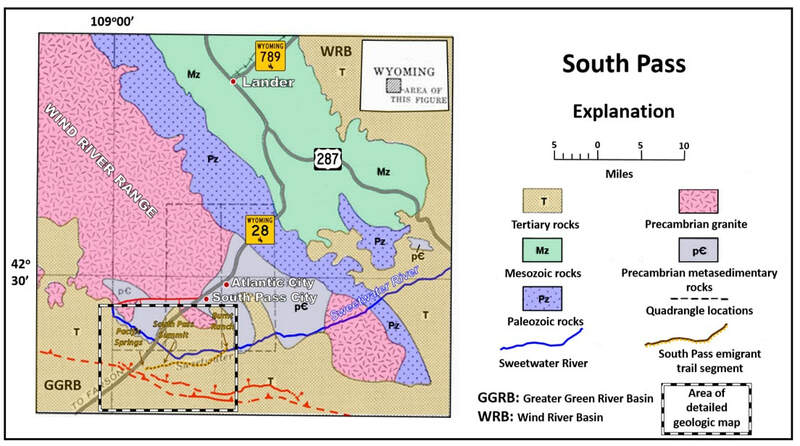 Collapse of the southeast margin of the largest basement-cored, Laramide Uplift in Wyoming created the gateway and that made all the difference in the settlement of the American West. You could easily spend a day visiting interesting places in the South Pass area. Our recommendations are to: 1) visit the reconstructed mining town at South Pass City State Historic Site, 2) visit the ghost town of Miner’s Delight, 3) visit South Pass where the Emigrant Trails and Pony Express cross the Continental Divide, 4) collect some banded iron formation, 5) visit Sinks Canyon near Lander and 6) eat at some excellent restaurants in Lander. ​There are three historic mining towns in this immediate area. ﻿South Pass City State Historic Site ﻿with the Carissa Mine is a reconstructed mining town open to the public. Atlantic City has numerous restored and altered private houses not open to the public except for a restaurant/bar. Miner’s Delight is a ghost town preserved by the BLM. We found Miner’s Delight the most scenic and secluded location of the three mining towns. It is a true ghost town with the BLM stabilizing about a half dozen crumbling buildings along a creek with trees and a beaver pond. This is a walking tour of about ½ mile. South Pass City has the most to see with a walking tour to over 20 restored/reconstructed furnished buildings along with the Carissa Mine. A Carissa Mine tour is led on Thursday through Sunday at 2:00 pm. After paying admission to South Pass City, there is a free opportunity for the kids to pan for gold in the creek with pans provided at the general store and gravel brought in from a nearby placer deposit. Directions to Miner’s Delight (see Google map): coming from Lander about 26 miles and as you get to the abandoned USS Atlantic City strip mine, turn left on paved WY 28A (zero your odometer), 1.5 miles turn left on paved Atlantic City Road, 2.1 miles turn left on gravel Fort Stambaugh Road, 2.4 miles Big Atlantic Gulch Campground on left, 4.9 miles turn left into Miner’s Delight, 5.0 miles park next to fenced cemetery and walk downhill through trees on dirt road to Miner’s Delight. Directions to South Pass City State Historic Site (see Google map):coming from Lander about 31.6 miles and having passed the abandoned USS Atlantic City strip mine HQ by 3.4 miles, turn left on South Pass City Road/479 (zero your odometer), 1.6 miles go straight/bear right at junction with road on left to Atlantic City, 1.7 miles Carissa Mine on left, 2.3 miles arrive at South Pass City State Historic Site. Check the South Pass City website for hours and season of operations. One of the best places to see the Emigrant Trails is where they cross the Continental Divide at South Pass (not to be confused with South Pass City). Directions (see Google map): Traveling south on WY 28, about nine miles from the South Pass City area you will come to the South Pass Rest Area on the right that is located on the Sweetwater River. From the rest area, continue south 0.9 miles on WY 28, turn left (southeast) on Oregon Buttes Road (Fremont County 445). Travel 2.8 miles on this gravel road until it takes a right bend and intersects a dirt road. This dirt two-track is the location of the Emigrant Trails and Pony Express, which was a multi-lane trail in this area. There is an Oregon Buttes interpretive sign on your right at this intersection. If you have a high clearance vehicle, turn right (west-southwest) and travel on the wagon trail. If you have a passenger car, you should walk it from here. At 0.2 miles, the road splits, take the right fork. Continue past the fork another 0.6 miles until you reach a fenced area for the South Pass Monument marker and interpretive sign. You might have been expecting a narrow mountain pass over the Continental Divide. However, it is a desolate, broad flat area that separates the Pacific and Atlantic drainages. It is so subtle that many travelers did not know they had crossed the pass. It has changed very little out here since the 1850’s. More information and directions can be found on pages 64 to 66 in a pdf by The National Park Service on the National Historic Trails Auto Tour Route Interpretive Guide across Wyoming. ​Banded iron formation (BIF) is an attractive rock, especially if it contains folds. It is unique to the Precambrian and has layers of alternating magnetite and quartz. The layers are about 0.1 to 0.5 inches thick and the rock is black to dark gray. Sometimes at surface outcrops, oxidation of the magnetite to hematite has produced a brown or rust color. Iron content is about 33 percent and the silica content is about 50 percent. Directions (see Google map):An outcrop of banded iron formation is on Forest Service land upslope and north/northeast of Beaver Creek on the northwest side of highway WY 28. Coming from Lander, this site is just before you get to the private land associated with the abandoned USS Atlantic City iron mine. If you zero your odometer in Lander at the major intersection of Main Street/US 287 and WY 789, drive south on US 287/WY 789 toward South Pass & Farson, 8.5 miles continue straight on WY 28 south toward South Pass (do not turn left on US 287/ WY 789), 10.0 to 13.8 miles observe Mowry shale in the ridges on the left, 16.5 to 17.0 miles observe Nugget Sandstone on left, 17.5 miles observe red Chugwater in roadcut on left and in scenic valley to right, 18.3 miles observe Phosphoria dip slope off mountains to right, 23.8 miles turn right on Limestone Mountain Road (FS 326), 25.1 miles road forks take left fork (FS 326), 25.7 miles park on right side of road. Approximate ½ mile hike one way to banded iron formation. Hike downslope to the right of a grove of aspen trees, cross a dry creek and climb a tree covered hill with outcrops of Cambrian Flathead sandstone. On the east end of this hill out of the trees (left), just barely downslope of the crest are outcrops of Precambrian banded iron formation. There are a couple of small exploration pits with good samples. Dan Hausel shows another banded iron formation (BIF) location on public land in a Wyoming Geological publication Economic Geology of the South Pass Granite Greenstone Belt, labeled 25A on Plate 2 at the very end of the report that can be downloaded for free (36 MB). This spot is in the central and very northernmost part of section 9, T29N R100W (BLM land) near the boundary with section 4 (mostly Forest Service land). It is just a tenth of a mile east of Highway 28. I found black schist rock along Highway 28 near this location, but could not find the outcrop of banded iron formation. Perhaps you will have more luck than me. Take a magnet on your hunt. Directions (see Google map): Zero your odometer where Limestone Road (FS326) joins WY 28. Head south on WY 28, 0.9 miles cross Beaver Creek, 2.2 miles junction with WY 28A on left (road to Atlantic City and Miner’s Delight), 3.1 miles mine pond on right, 3.1 miles entrance to abandoned USS Atlantic iron mine HQ on right and junction with WY 28A on left, 5.5 miles road to Louis Lake on right (FS 300), 6.3 miles park on side of road and walk to banded iron formation location 25A on east side of highway (left ~ 0.1 mile), 6.6 miles Fremont County 615 on left.